I found this FREE Marshmallow Bunny pattern and I had to share it with you for today’s FREE crochet pattern! I think these bunnies are adorable and I LOVE the colors that are used! You could make this bunny scarf, sew these bunnies onto a baby blanket, baby hat, baby bib, etc or use them any way you choose! They measure 6 1/2″ long x 3″ wide, as shown. The bunnies are made with worsted weight yarn and an E hook (I think the designer used a smaller hook than usual to make them very solid). 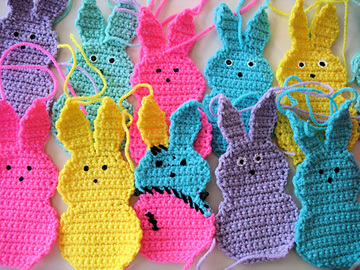 If you want smaller marshmallow bunnies, consider using size 10 crochet thread and a steel hook. I hope you enjoy this FREE Easter pattern. Easter is just under 3 weeks away, so it’s time to get hopping (pun intended)! This entry was posted in Crochet patterns, Free crochet patterns and tagged crochet patterns, free patterns. Bookmark the permalink.